By using TF card reader, connect the TF card with computer, open the memu. 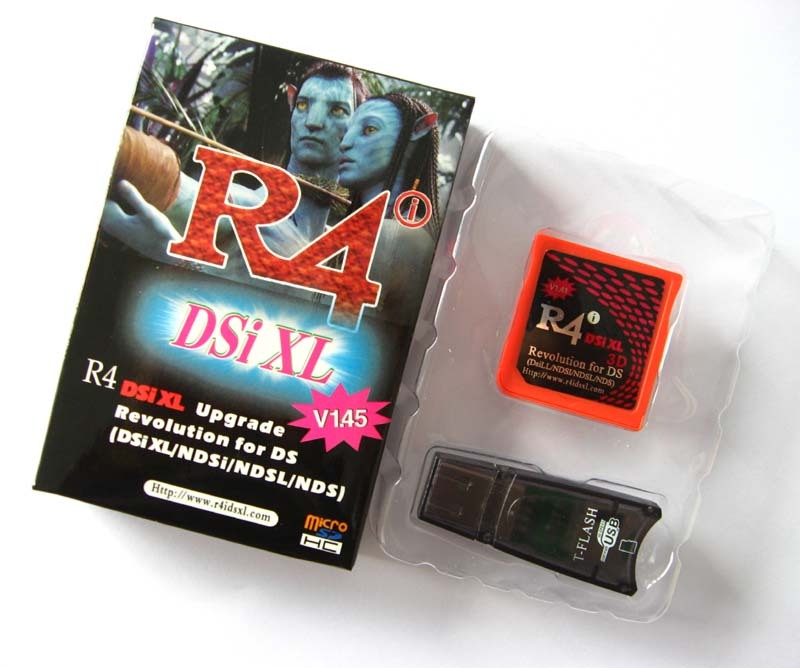 a. Upload game kernel: Copy the R4.DAT file to your TF card..
c. Upload DIY Interface function: Copy the R4iMenu to your TF card . Make sure microSD card with Kernel is inserted in r4dsixl3d NDSI, then insert r4dsixl3d NDSI in NDS SLOT-1 port, start the machine and enter main menu interface. By pressing buttons (right and left) or touching screens, you may choose the games or media function, press A to the relative function. Choosing game function in Main Menu to enter Game interface, return to main menu by pressing R.
In Game Interface, press L to adjust 4-level brightness. In Game Interface, it’s on top screen showing game messages including four items: game, cheat, setting and ROM, while it’s on bottom screen showing game name, file size and current game category. Press “UP” and “DOWN” to check current page easily, and press “LEFT” and “RIGHT” to turn over the page, on the top line of bottom screen, it is showed with current file and total file qties, while on bottom line of the bottom screen the path of the category. Press X or B, enter four items in the top screens: game, cheat, setting and ROM. Enter cheat item, it’s showed in the bottom screee Current game name, cheat function setting, cheat function switch, timely reminding window and file saving. Touch Cheat off/Cheat on to run the cheat function, and touch file saving to save the file. Enter Setting item, it’s showed in the bottom screen there languages: English, Simplified Chinese and Japanese, touch file saving to save the relevant file. Enter ROM item, it’s showed in the top bottom screen cheat, DMA, software start functions, touch the relevant file to save the file. When the Soft-Reset function is ON during game, “L+R+A+B+X+Y” kdy combination can be pressed to return R4-II menu.. Don’t save during soft reset, otherwise “archive lost” will be led. It is recommended to return game main menu and then soft reset. If Soft-Reset can not be operated or the Game is impacted, please turn off the soft-reset function. Choose your expected game in the game menu, press A or touch the screen to play games. The updated date of the files will be automatically revised while playing the games each time, the updated files could be easily found by checking the latest date revision. The names of the files are the same as which of the games, expanded name is SAV. Which can be copied to computer at any moment. Choose the games, enter Cheat by pressing B or X. Game Title is showed in the top screen, while it shows in the bottom screen reminding window, Cheat off/Cheat on, file saving, current Cheat items. Choose your expected Cheat item by pressing “up” and “down”, and open or close the item by pressing A or touching the screen. Touch “Cheat on/Cheat off” to operate the Cheat, and touch the screen to save the file. While the Cheat is running, you may choose the cheat code one by one by pressing “up” and “down”, and close the cheat code by pressing “A”. Under Cheat Code Category, press A to open/close the category. You can delete the cheat.dat file in R4iMenu category if the cheat function is not required. Cheat database updates: Download the newest cheat database and copy usrcheat.dat file to R4iMenu category. Four files are alternative in the R4iMenu/Skin category: they are TScreen.bmp, BottomInit.bmp, TScreen.bmp and BottomScreen.bmp, which are the operation interface of r4dsixl3d, content in the pictures can be changed at random. if you can not download the kernel from the official website http://www.r4idsxl.com/downloade.asp, you can download it from here. we have offered it. You are currently browsing the archives for the Flash Card category.